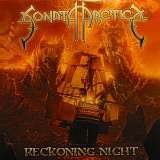 With Reckoning Night being the fourth full-length release from these Finnish melodic power metal masters, Sonata Arctica really is no longer a newcomer to the scene. With three solid studio albums behind them, numerous CD singles and E.P. 's as well as the obligatory live album, they're becoming more established, more confident and are in fact influencing the sound of new acts coming out in the same genre much like they used to look to Stratovarius for inspiration early in their career. Sonata Arctica literally came out of nowhere and blindsided us with their debut album Ecliptica in 2000. It still has to be one of the best debut albums of any metal band in recent history and I still think it ranks among the best melodic power metal albums ever made. It was one of those albums that you became obsessed with and you couldn't stop playing it. I enjoyed Silence and Winterheart's Guild as well but the magic that was created on the first album only made brief appearances on those albums and the consistent quality of the songwriting wasn't quite up to par with their debut. After reading some studio reports from the band during the recording of this album, I was intrigued by the reports that this new album would be a little heavier and a little more darker in atmosphere than with previous albums. I'm really glad that I took the time to really listen to this album carefully as quite frankly, the first two listens had me thinking that this was a very "safe" and simple sort of album for this band. At first, the melodies seemed to all be recycled and the speediness of a few tracks just so cliché. After the third and fourth spins of this album, it really began to grow on me. The trademark speedy Sonata Arctica sound makes appearances on many tracks including Misplaced, Ain't Your Fairytale, Don't Say A Word (the first single), My Selena and Wildfire. The melodies soar with Tony's vocal layering technique, boosting the melodic quality of their music into the stratosphere. The choruses are catchy and huge and most feature amazing lead guitar and synthesizer trade-off leads. Misplaced has chorus sections that have big W.A.S.P.-like thundering chants. A nod to classic British rockers Uriah Heep can be heard with a change in tempo mid-song to a solo Hammond organ riff with the whole band eventually all coming together to pound out a Gypsy-like organ/guitar riff. This track as well as Don't Say A Word and Wildfire see Tony using more hard-edged vocal styles which give the tracks a more intense, attacking and heavier sound. Some extended instrumental passages such as found on My Selena add great atmosphere to what would otherwise be a somewhat predictable song arrangement. More mid-tempo numbers like Blinded No More, The Boy Who Wanted To Be A Real Puppet, White Pearl, Black Oceans and Shamandalie see the band showing another side of themselves. Blinded No More, with it's catchy style and emotionally wrenching vocal by Tony even has a more commercial feel to it. The Boy Who Wanted To Be A Real Puppet has a more progressive edge and with it's story-like lyrics and operatic vocal style with choruses of voices, the realm of the "Metal Opera" as done many times over the last few years comes to mind. White Pearl, Black Oceans is an almost 9 min. epic that alternates between quieter and heavier passages and it also has the big choir style choruses and an overall "epic" feel. Shamandalie, with another heart-wrenching vocal by Tony, alternates between mellower acoustic passages and heavier segments and the melodies in this song are simply wonderful. The production kills on this album and everything is mixed perfectly. The overall sound and style shows some similarities to fellow countrymen Nightwish with the big thick guitars and thundering bass that are all part of a very crisp production. I don't think I've ever heard Sonata Arctica sound this intense and heavy and the guitars are more up front in the mix. All the rich melodic characteristics are ever present but I think they've turned it up a notch as far as intensity. The overall feel really reminds me more of their first album Ecliptica more so than either Silence or Winterheart's Guild. Better songwriting and more attention to variety in tempos and styles of songs proves to be the winning formula. I love the melodic style of this band but the bottom line is.....it still has to rock and this album does that in a big way. Another fine album from the Finns and although it's not quite masterpiece quality, it captures the atmosphere and intensity of their first album but shows progression away from their syrupy sweet style to a more intense one; all the while keeping the melodies as solid as ever.